I know I have been absent, but there have been so many irons in the fire. 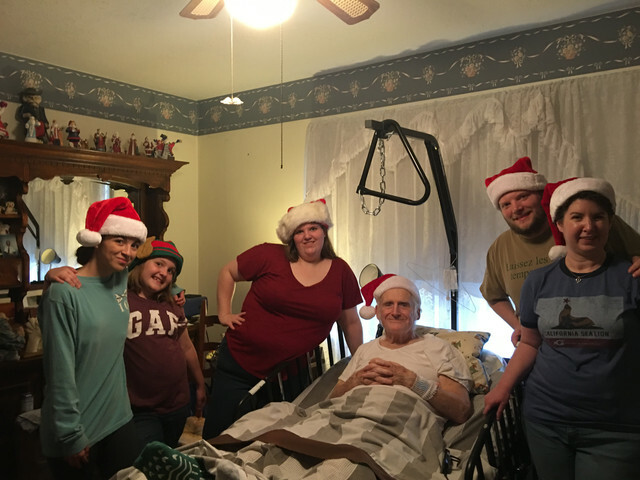 My father is on home hospice and it was a big "if" he would make it until Christmas. Thank God he is still here. I want to share a photo of my kids with you. This is my son with his wife and my daughters. I'm hoping to add a grandchild by next Christmas. Oh, as those who follow me on FB or YT can attest, I'm a dead ringer for a certain fat, jolly old elf. Nice to hear from you Sarge. Happy Holidays! Merry Christmas, Sarge. Glad you got to have one more with your father. Sarge!!!!! Nice to hear from ya. Awesome pic. Hope you and yours had an enjoyable Christmas. Happy Christmas, and Merry New Year Sarge. Good to see you again, kids lookin good, Merry Christmas to you and yours. Thanks for all the nice wishes. Im sorry things arent going well for you Sarge,I hope they get better!